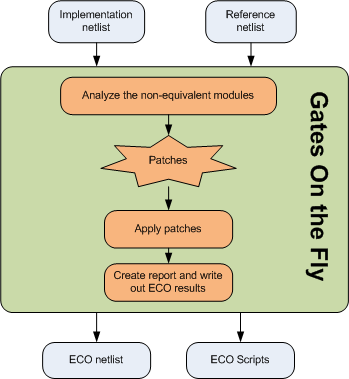 GOF, Gates On the Fly, provides complete netlist solutions to accommodate various netlist ECO and debug scenarios. Gates On the Fly implements several cutting edge ECO methodologies. Netlist ECO varies in size and complexity from case to case. Design process changes from company to company. Gates On the Fly gives users flexibility to choose one or several of the methodologies depending on the size and complexity of the changes. 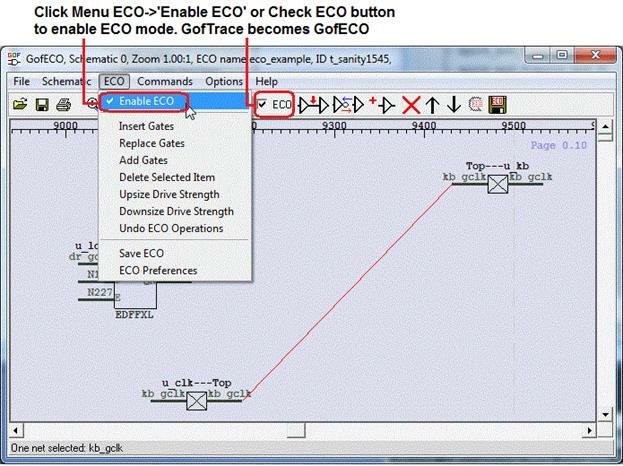 The automatic functional ECO is done by a GofCall ECO script. The flow needs Implementation Netlist which is under ECO, and Reference Netlist which is re-synthesized from modified RTL with the same constraints as the pre-layout netlist. The top down API 'fix_design' is used to perform a global ECO. GOF uses the built-in Logic Equivalence Check engine to find and analyze the non-equivalent points in the top level module and its sub-modules. Logic patches are created to fix the non-equivalent modules. The final patches are optimized circuits with minimum gate count that make Implementation Netlist equal to Reference Netlist. The patches can be mapped to spare-type-gates by 'map_spare_cells' API. When ECO changes are known and ECO size is small or the operations are repetitive like adding inverts on a bus, manual mode ECO is a better choice. Since it is more efficient and the final gates touched can be less than automatic mode ECO. 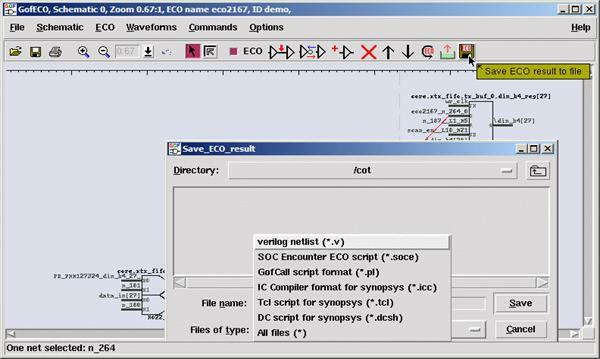 Moreover, automatic and manual mode ECO can be interleaved in one GofCall ECO script. When ECO is done in either automatic mode or manual mode, 'map_spare_cells' command is run to convert the newly added cells to spare gate types cells. Users can control only spare gate type cells being used in manual mode ECO, so that the converting stage can be bypassed. GUI mode ECO has advantage of fast ramping up. It’s good for small size ECOs. The incremental schematic feature is very helpful for analyzing the netlist before the next step is decided. The incremental schematic is very useful in pinpointing the logic issues. GOF supports many useful APIs to fast access the database. In section 2, eight ECO flows are listed to accommodate different ECO scenarios. In section 3, a guideline is provided for choosing the ECO flow. The tool supports Linux 64bits OS. Download the release package and unzip to a directory. Set 'the_64bit_install_path/GOF64/bin' in search path. Contact support@nandigits.com for evaluation license, if the evaluation netlist size is larger than 500K bytes. There are two license modes, fixed node mode and floating node mode. Fixed node license: Copy the license file to "the_install_path/GOF64/bin" and restart GOF. Full layers functional ECO can add or delete gates freely. The ECO operations are done in a GofCall script which is compatible with Perl, and it uses exported APIs to access the netlist database. GOF reads in two netlist files, Implementation Netlist which is under ECO and Reference Netlist which is re-synthesized from modified RTL with the same constraints as the pre-layout netlist. In the GofCall script, the top down API 'fix_design' is used to fix the top level module and its sub-modules in global mode. GOF uses the built-in Logic Equivalent Check Engine to figure out the non-equivalent points. And optimized minimum size gate patches are applied to fix the non-equivalent modules. As shown in Figure 1, two logic cones are extracted from the implementation and reference netlist for the same compare point. The implementation point mismatches the reference point initially. GOF compares the two points and generated a patch from Reference logic cone and applies to Implementation Netlist. After the patching, the two points become equivalent. GOF does logic cone analysis and optimization for each failing point found in top down logic equivalence check. The failing point is in format of output port or sequential element’s input pin, such as flop’s D input. The final patch has the minimum number of gates to make the implementation logic cone equal to the reference logic cone. The flow chart is shown in Figure 2. The GofCall script has exact the same syntax of Perl script. It can execute exported APIs that access the netlist database and modify the netlist. The GofCall Script can be run by ‘-run’ option. If all RTL changes are known to be contained in one sub-block and its sub-modules, the top level scope can be set to the sub-block. 'fix_design' can apply to the block and its sub-modules. User can choose to fix the selected modules in implementation netlist, when RTL changes are known to be isolated inside the specified modules. For example, the above design has only two modules modified, WIFI and ENC, and the changes are isolated in these two modules not propagating through hierarchical ports. ECO API, 'fix_modules' can be run on these two modules. Some logic in netlist should be ignored in Logic Equivalence Check and ECO, for example, DFT logic or MBIST logic. Several APIs can be used for the excluding purpose, set_ignore_output, set_pin_constant. 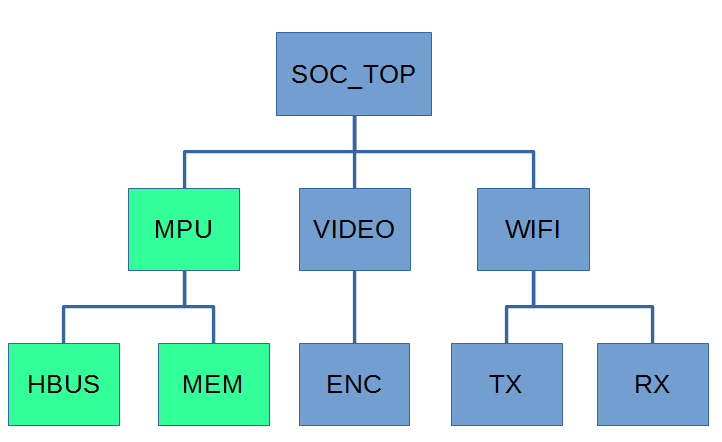 For example, the SOC_TOP design should have scan insertion test logic excluded in ECO. The scan out bus pin has naming of scan_out[199:0] and API set_ignore_output can be used to exclude LEC check on scan_out in ECO. And scan_enable and scan_mode are two scan set up signals which can be forced to zeros by API set_pin_constant. Physical Synthesis is more and more popular in logic synthesis. 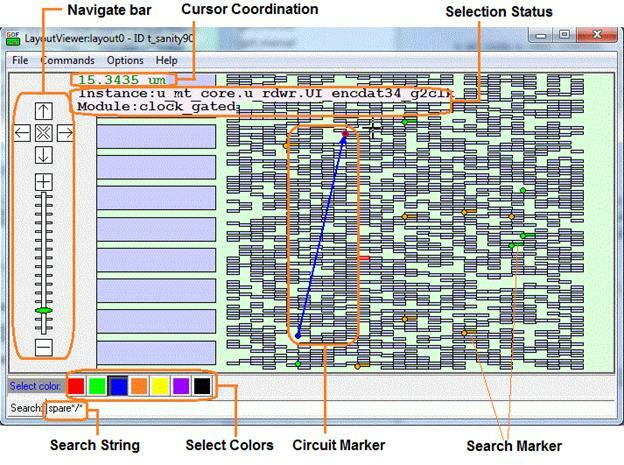 Physical Synthesis may add hierarchical pins that are not in RTL code and it may bring mapping issue when Implementation Netlist is comparing with Reference Netlist. API set_noexact_pin_match can be used to resolve the mapping issue between Implementation Netlist and Reference Netlist. For example, some physical synthesis tool adds 'IN1', 'IN2' ... to hierarchical modules. The new added pins are not necessarily matching to each other in Implementation Netlist and Reference Netlist. They need to be excluded in pin matching. API set_noexact_pin_match is used before loading design. Place and Route tool may invert some flip-flops' phase by moving inverter from input pin to output pin. API set_mapping_method('-phase') is used to handle these flip-flops. The Cutpoint Method is to fine tune the ECO result. When an ECO involves one combinational wire change, the Cutpoint Method can produce very small patch. The side effect of the Cutpoint Method is, it runs slow on large ECOs. 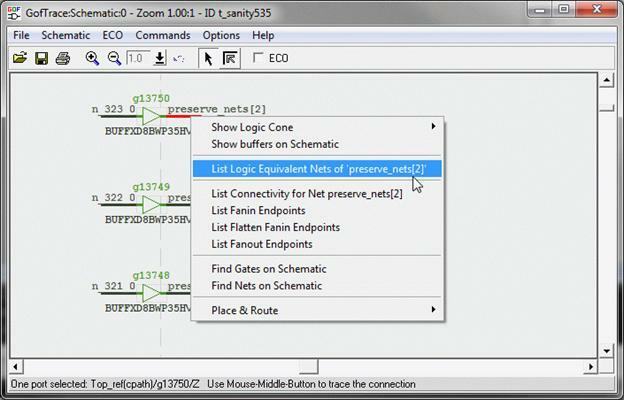 The built-in Logic Equivalence Check Engine is dedicated to search equivalent nets in Implementation Netlist to optimize the patch circuit. The searching process is global. For each net in the Reference Logic Cone, any net in the Implementation Logic Cone with the same fanin end-points is compared for Logic Equivalence. Users can check equivalence on any two nets in the reference and implementation netlists. The API 'comare_nets' can be used to compare any two nets in Reference Netlist and Implementation Netlist. $net0: The net in Reference Netlist. $net1: The net in Implementation Netlist. $result: If 1, they are equal, if 0, they are not equal. Scan chain can be updated to insert the new flops. 'stitch_scan_chain' command can be used to automatically stitch up the new flops. The scan chain can be reconnect up by manual change_pin commands as well. The module mentioned in the section above can have hierarchy kept instead of flatten, and being written into ECO netlist as whole. This flow needs the module and its sub-modules written out in a separate verilog file, then uses read_library to load the file with '-vmacro' option. GOF treats the module as a leaf cell. The content in file syn_macro.v is written into the ECO file eco_verilo.v as a whole. The corresponding instance is created as well with ports connected correctly according to Reference Netlist. When modifying RTL and do re-synthesis, care should be taken to maintain the database as much alike Implementation Netlist as possible. After synthesis, a new flop instance 'abc_new_reg' is created. GOF may fail to find that 'abc_new_reg' being able to merge with 'abc_reg', due to other non-equivalent points present, which brings a redundant fix in the new register creation. So it is highly recommended to keep the sequential signal names. When do re-synthesis, the same constraints should be used as what has been used in Implementation Netlist synthesis. If any hierarchy is not present in Implementation Netlist, flattening command should be used in synthesis to flatten the module to the maintain the same hierarchies. It can detect if there is any floating or multiply drivers after ECO. In Metal Only ECO, the design has completed place and route. Any new gates added should map to spare gates that located in the design. Two ports 'and/or' gates and 'inv' gates, 'mux' is optional. Two ports 'nand/nor' gates and 'inv' gates, 'mux' is optional. A Design Exchange Format file is needed to map new instances to the closest spare gate instances. If DEF file is not loaded, GOF processes the ECO with gates type from the spare list without mapping to the exact spare instances. P&R tool like SOC Encounter maps the new instances in the new netlist to the closest spare gates. 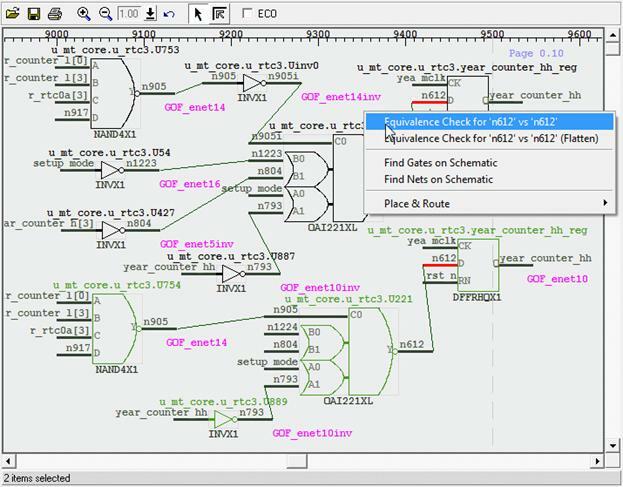 In 'fix_design' command, GOF analyzes the top level module and its sub-modules to isolate the non-equivalent points and optimize the logic cone to find the minimum gate count patch circuit. The flow can use external Synthesis Tool as well. The executable synthesis command should be in the search path. 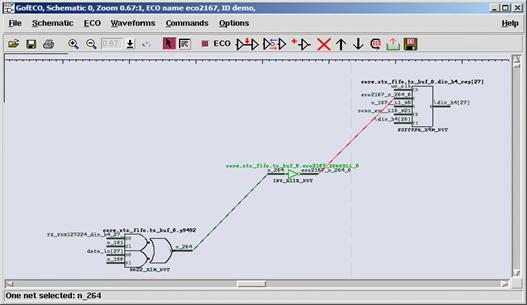 The supported Synthesis Tool is RTL Compiler from Cadence and Design Compiler from Synopsys. GOF writes out the patch in Verilog file and a TCL script for external Synthesis Tool if it's enabled. The TCL script is to constrain the Synthesis Tool to use spare gates only when remapping the gates in the patch file. The Synthesis Tool is run with the Verilog file and TCL script as inputs, and it writes out remapped Verilog patch file which has only spare gate types. When the spare-only patch file is created, user can pause the flow by '-pause' in 'map_spare_cells' command. 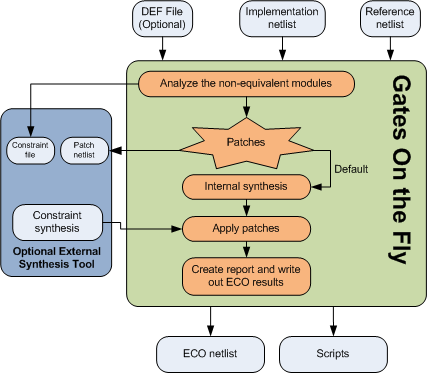 User can either modify the patch file manually or tunes up the constraint file to rerun the synthesis for several iterations until the patch netlist meets the requirement. Then press 'n' key to resume the flow. GOF reads back the spare-only patch file and fits the circuit into Implementation Netlist to fix the logic cones. When ECO is done, a report can be created and ECO netlist/ECO script can be written out for the back end tool and LEC tool. Standard library (Synopsys Liberty) files with extension '.lib'. Other Verilog libraries if '.lib' files can’t cover. DEF (Design Exchange Format) file. It’s optional. If it is not loaded, GOF won’t map the spare gate type cells to the exact spare instances. Spare gates pattern. It is in 'hierarchical_instance/leaf_instance' format. It has wild card '*' to match the spare gates in Implementation Netlist. Spare gates list file. If several users work on the same Implementation Netlist, the initial spare gates list file should be generated only once. And new spare gates list file must be created every time an ECO is done. 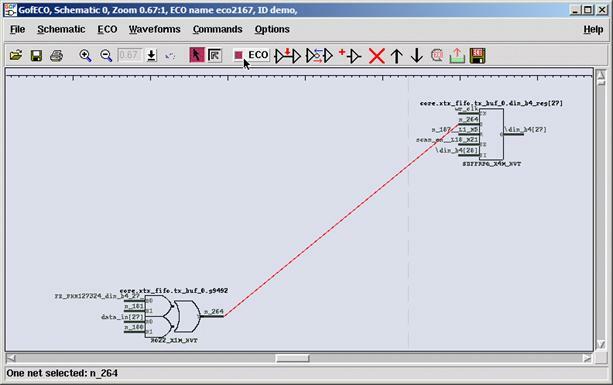 Load Standard Cell libraries and Verilog libraries. Load Reference Netlist and Implementation Netlist. Load LEF file, optional. It's useful in LayoutViewer feature. Create Spare Gates List by Spare Gates pattern or by reading in spare list file. Run 'map_spare_cells' to remap the patch from 'fix_design' command to all spare -type gates patch netlist and select the closest spare instances for each gate in the patch netlist. Report ECO status and write out ECO results. The GofCall script has the exact same syntax of Perl script. But it can execute exported commands that access the netlist database and modify the netlist. # with updated spare list. The GofCall Script can be run by '-run' option. User can insert 'die' command to let GOF stop in some point and do interactive debugs when ‘GOF >’ shell appears. GUI mode can be enabled by run 'start_gui' command. If the automatic metal only ECO has new gated clock cells added while the spare gates list doesn't have gated clock cell, "convert_gated_clocks" API should be run to convert gated clock cells to 'MUX' type logic. GOF maps the 'MUX' type logic to the spare type gates in 'map_spare_cells' API. In many cases, the ECO operations are well known by users. They can be inserting buffers to a 128bits bus, or adding isolation AND gates to all outputs of a module. In these cases, manual ECO by scripts is more efficient and resource saving. GOF exports many APIs for ECO operations in GofCall script. 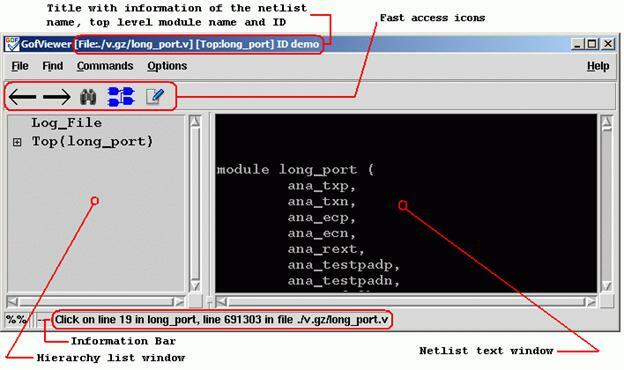 Run LEC on modified RTL to Implementation Netlist. Collect the failing points in the above run. Define ECO name in ‘setup_eco’. Use ECO APIs to fix the logic. Locating ECO point is the hardest part in manual ECO. Wire names in RTL codes are normally optimized away by synthesis process. GOF has a feature to retrieve the nets. Check here for the GUI way or use API ' get_match_nets' in GofCall script. Standard library (Synopsys Liberty) files with extension ‘.lib’. change_pin: Modify pin connection in ECO. change_gate: Modify an instance type in ECO. change_net: Change an existing net's driver. change_port: Change an output port's driver. new_net: Create a new net. new_gate: Create a new gate instance. new_port: Create a new port. For the full list of the APIs, user can type 'help' in 'GOF >' shell. A Perl 'for' or 'foreach' loop can handle repetitive work efficiently. For example, to add a 'AND' isolation gate for every output port of a module. A buffer is inserted into A pin of instance U0. The old existing net drives the new buffer now. The special character '.' is used in ECO new instance name if the new instance needs to be in the same hierarchy as the ECO spot. If the instance is empty, GOF creates 'AOI21X2' in the current top level. With ". ", GOF creates 'AOI21X2' new instance in hierarchy "u_qcif/u_num2/u_spare1". In Manual Metal Only ECO, any new added gates are automatically mapped to spare gate instances by 'map_spare_cells' command. A Design Exchange Format file has to be loaded for the tool to find optimal spare instances. If the file is not present, the mapping is skipped. 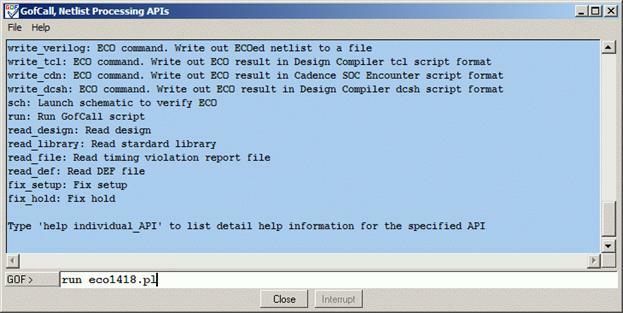 Standard library (Synopsys Liberty) files with extension '.'lib'. DEF (Design Exchange Format) file. If it is not loaded, GOF won’t map the spare gate type cells to the exact spare instances. Spare gates pattern. It is in ‘hierarchical_instance/leaf_instance’ format. It has wild card '*' to match the spare gates in Implementation Netlist. Spare gates list file. If several users work on the same Implementation Netlist, the initial spare gates list file should be generated only once. And a new spare gates list file should be created every time ECO is done. # spare instance name is returned. # add buffers for long connections. The following paragraph demonstrates how to insert buffers and inverters into a circuit in GUI mode. In GofViewer netlist window, press ctrl-g or menu commands->’Launch GofTrace with gate’. Fill in the instance name that needs ECO. 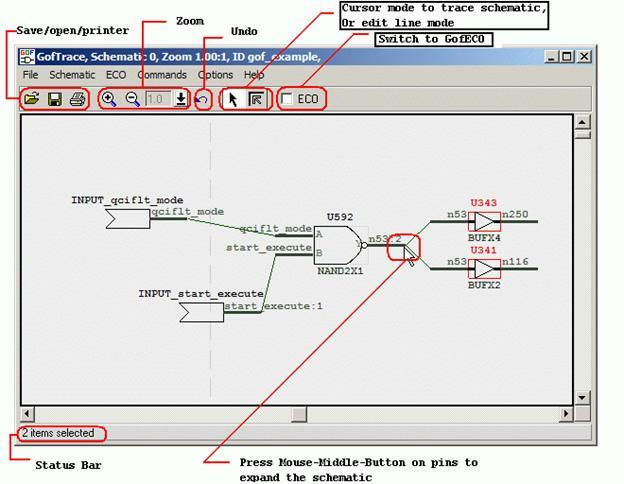 In GofTrace schematic window, use mouse middle button to expand the schematic. In this case, pin D of the flop should be inserted an invert. Press mouse-left-button on the wire to select it. 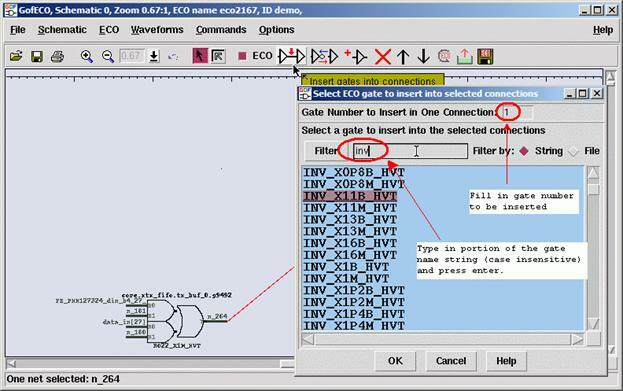 Click ECO button ‘Insert gates into connections’, select the right invert in the gate type selection window. In ‘Pin Connections’ setup window, use default ‘Complete Loop’ option, so that the gate can be inserted in the net. Click OK and the invert is inserted. Press ECO button ‘Save ECO result to file’. And select the format to be saved. 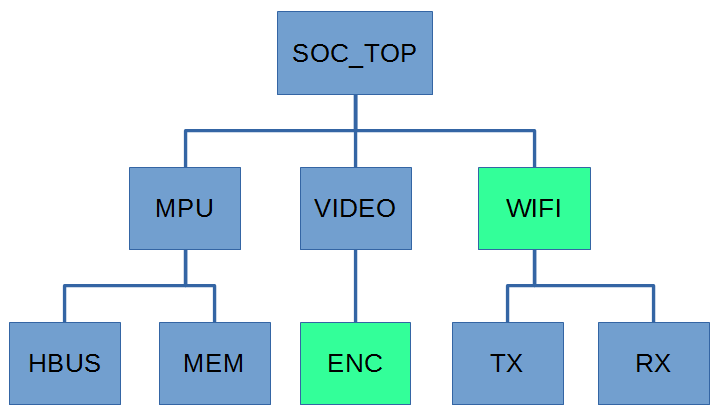 The supported formats include verilog netlist, SOC Encounter ECO script, GofCall Script, TCL script and DCShell script. Metal ECO can only use existing spare gates on the silicon. Gates On the Fly controls how to use these spare gates. User can add any type of gates and let the tool map to the exact spare gate instances. The detail setup for four method can be found in GofECO Metal Only ECO. Use cases can be found in online document. Type 'help' in interactive shell 'GOF >' to list all APIs. If '-run' option is present in the command line, and 'gexit' is not in the script, or GOF meets error when executing the script, GOF goes to interactive mode with GOF shell 'GOF >'. In GOF shell, GUI windows can be launched by 'start_gui' or 'sch' commands. When GOF is run without '-run' and '-shell' option, it goes into GUI mode. GofViewer is the first window after GOF starts up GUI interface. If any netlist file or design file has been updated during GOF session, this command can be used to reload the design. GOF loads only one module in the netlist text window when the netlist file is hierarchical with multiple modules. The command loads the corresponding module into the text window and highlight the line with the specific number in the netlist file. This command exits GUI mode and switches to shell mode. It has ‘GOF >’ shell interface in shell mode. GOF reads in SDF Index File instead of SDF file itself, since SDF can have huge size. Once the index file is created it can be reused next time and loaded in much faster. Read out MAC address. When users decide to purchase licenses or ask for evaluation licenses, MAC address is required to generate GOF licenses. Save the schematic to a file for future usage. 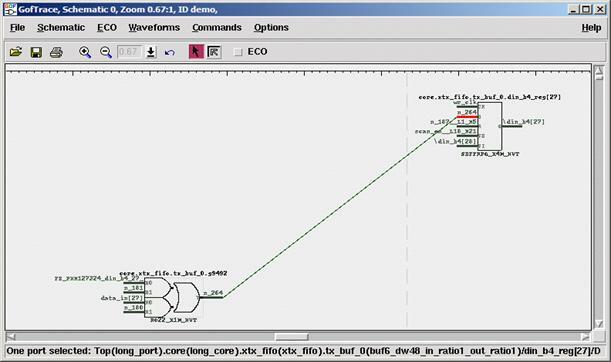 The saved file has extension ‘.st’ which can only be used by GOF in ‘Open’ schematic command shown below. This command creates SDF file index file. GOF doesn’t load the full SDF file, but SDF index file instead. Wire names in RTL codes are normally optimized away in synthesis process. GOF has a way to retrieve them. A reference netlist with the wire names preserved should be synthesized. There are several ways to preserve wire names. Reference Netlist can be loaded by '-ref' option in command line. For example, "gof -lib tsmc.lib implementation.v -ref reference.v"
GOF stays in shell mode when the script finishes.